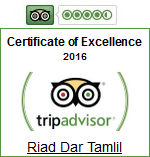 We enjoyed our stay at Riad Tamlil. The location was nice, right in the center of all the hustle and bustle of the medina but inside it was a quiet retreat. Also, we enjoyed having our breakfast on the roof-top teraze. Our room was a little rustic, no white fluffy duvet and the shower was open to the rest of the bathroom which was fine just rustic. The staff was nice too.